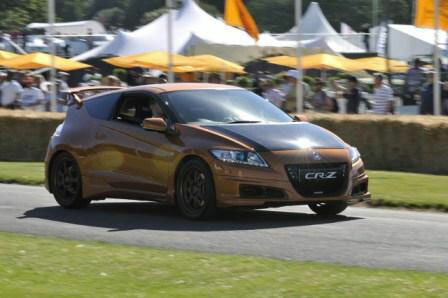 At the recent 2011Festival of Speed held at Goodwood, MUGEN presented not one, but two Concept cars for their World public debuts – both cars based on the increasingly popular Honda CR-Z hybrid. as it does over 3.5 seconds off the standard cars 0-60mph time. The unique feature of this car is that the driver still has the choice of 3 driving modes and, as with the standard original car, the “ECON” mode can still offer the opportunity to reduce fuel consumption and attain as much as 50 miles per gallon. The CR-Z MUGEN concept has been produced to demonstrate that it is possible to take a hybrid car and develop it to provide genuine performance characteristics, whilst still retaining the economic and environmental values for which the Honda IMA hybrid powertrain has been designed. At the touch of a button the driver makes his own choice of economy and/or outright performance. In parallel, the engineers at M-Tec Company have been developing their own car in Japan. 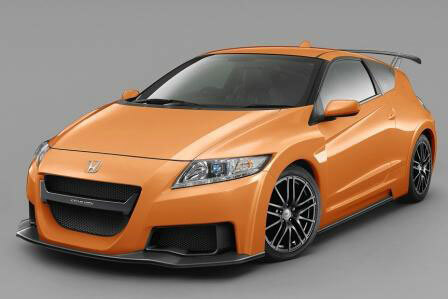 Dubbed the MUGEN CR-Z RR, and named after the first road car ever produced by MUGEN (the MUGEN Civic RR), the CR-Z MUGEN RR Concept is a design study produced to demonstrate the styling and build quality for which the MUGEN brand is famous. The car is finished in a unique shade of Orange and features many carbon weight-saving panels including bonnet, doors and a rear tailgate; with a full-length flat underbody leading into a rear diffuser, also all in carbon, to provide aerodynamic drag-reduction. For the interior the Orange theme continues with many styling touches including MUGEN-branded Leather/Alcantara front seats, a one-off Orange gearshift knob, and a double-DIN display unit incorporating chassis and engine data logging along with the ability to “learn” a circuit and then track the car during laps of the circuit by GPS to record performance data. Now that they have been unveiled to the World, both cars will continue to be used for marketing and media purposes while development continues in the background, and although there are no fixed plans in place at this time for any further production, all feedback and opportunities will be investigated to explore the potential for any aspects of these programmes becoming commercially available in the future.